What does it mean if an individual is physically dependent on alcohol? It means that the individual is an alcoholic, or is addicted to alcohol. Is alcohol addictive? Yes it is. In the United States itself, approximately 18 million people have been diagnosed with an alcohol abuse disorder and research shows that over 70% of people who have developed dependence on alcohol experience physical dependence that lasts about 3 to 4 years. When an individual drinks to the extent that their drinking causes any type of problem, then it’s likely that they can be diagnosed with alcohol use disorder, which is a medical condition. There are two different forms of problem drinking. Alcoholism or alcohol dependence is when the individual shows signs of a physical addiction but continues their drinking despite all the problems it causes. Alcohol abuse occurs when the individual is not physically addicted, but their drinking causes other problems. Unlike the individual who is dependent on alcohol, the individual who abuses alcohol can stop drinking for as long as they like, and not suffer the withdrawal symptoms. Continuing to drink in the face of detriment to the individual’s health, work, family life and finances. Difficulties and decrease in performance, at work and otherwise. Developing a tolerance and needing more and more alcohol to feel intoxicated. Developing illnesses such as chronic liver disease. Tendency to be violent when under the influence of alcohol. Experiencing withdrawal symptoms like nausea and anxiety. The first step for the individual before treatment can begin is for them to admit they have an alcohol problem. Once they have taken that first step and want to get sober, there are many different treatment options available to them. Detox – The abrupt stopping of all alcohol intake is the beginning of the detoxification process. It is recommended that the individual seek medical guidance for detox, because they are certain to suffer withdrawal symptoms, which can be painful and lead to complications. In a medically supervised detox the individual will be given medication to lessen the effect of withdrawal symptoms. Recovery Programs – Alcohol addiction recovery programs offer services like group or individual counseling, therapy, mental health support and medical care. The individual could choose inpatient programs at recovery centers, or outpatient programs where they continue to live at home. 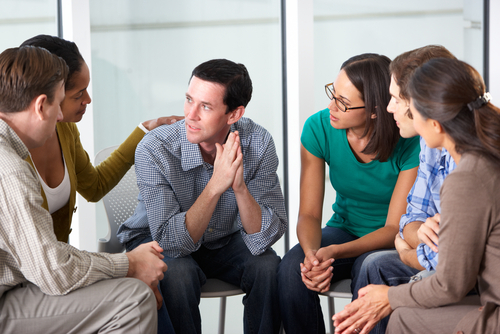 Support Groups – Alcoholics Anonymous needs no introductions. In general, a support group is a self help, peer level group for individuals recovering from addiction, which offers emotional support and specific tools to achieve and maintain sobriety. The 12 Step Program associated with Alcoholics Anonymous is a well known approach to sobriety.